One of the story lines last year in the TV show “Mad Men” involved a trip to Hawaii. The time was the mid-1960s and the gestalt was all Ray-Bans, Boeing 707s, and groovy loud colors. Don Draper, the main character, was there with his wife checking out the hotel that had hired his advertising agency to help promote paradise. I remember growing up in those days when the islands were as exotic as they were faraway, when adventurous friends of my parents came back with stories of hula girls in grass skirts, roasted pigs at luaus, and garishly cool Hawaiian shirts. Americans were beginning to travel then, and while the world was getting smaller, Hawaii was still a long trip and despite recently becoming the 50th state, in many ways more foreign than Europe. I couldn’t get that ‘60s imagery out of my head when the Golf Road Warriors played the Kaanapali Golf Club. Because in many ways, the town of Kaanapali—on the western coast of Maui just a few miles south of Kapalua—was where it all began. It was the first planned resort area in Hawaii (one article I read said it was the world’s original master planned resort! ), the initial shovel of sand turned over in 1962. Now there are 11 hotels—more than 5,000 rooms—along the three-mile stretch of exquisite beach. Everything is within easy reach and abundance. And, of course, that includes golf. 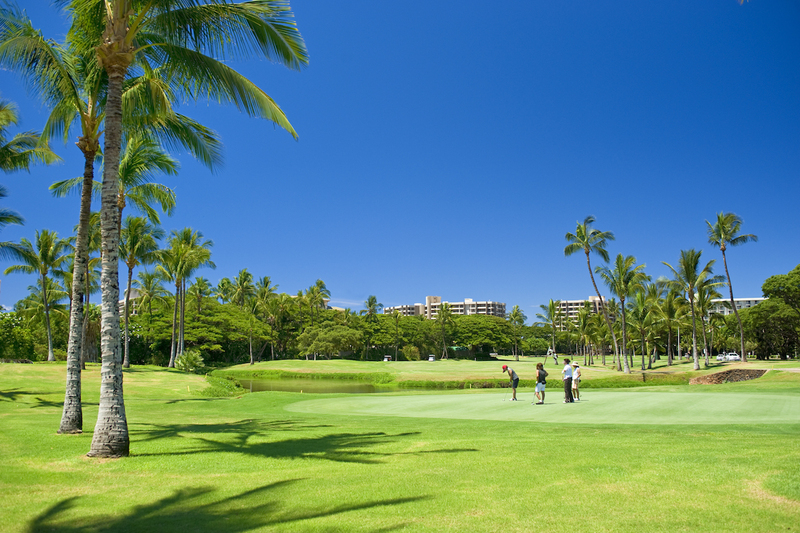 We played the original course, now called Royal Kaanapali, which was designed in ’62 by Robert Trent Jones Sr. (the architect who epitomizes the “Man Men” era as perfectly as a cold martini and lit Lucky Strike cigarette) and buffed up a few years ago by the late Robin Nelson. (There’s a second course, Kai, which is supposedly nice and not too challenging.) 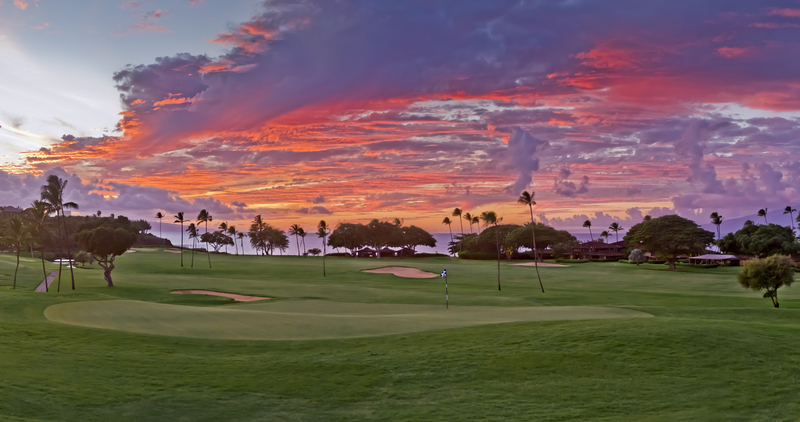 Neither a pushover nor a ball-breaker, Royal was the most enigmatic course of the five I played in Maui. I found it almost schizophrenic in that half the holes (the opening six and closing three) are on the west side of the main drag—Honoapiliani Highway, also known as Route 30—making them fairly flat and close together, while the other nine are upland, traverse a lush hillside of trees and vegetation, are more defined and separated from one another, and are both prettier and calmer. And yet for all that, the better holes are among the flat and crowded ones. The fourth is a short par four that bends right around big bunkers and climbs to an elevated green. The fifth is a long par four that parallels the fourth then finishes so close to the beach that approaches and putts are watched by legions of swimsuit-clad spectators walking to and from the ocean: I was reminded of the seaside courses in Britain where a public thoroughfare cuts across the links to the beach and it’s not uncommon to be asked how your round is going and even hear a polite golf clap for a particularly notable shot. (I strongly suggest you do not do as I did, which was to push my approach a bit and face a 50-yard explosion shot from unraked beach sand through a grove of palms.) The hardest hole on the course is the last, a sinuous and stout par four with a lake along its entire right flank and a tightly guarded and narrow green. Hitting into that green from anywhere other than the fairway is a crap shoot with the house holding the decided edge. Having been Royally beaten by the course, I’m still happy to report that it was as pleasant a thrashing as I’ve ever been handed, for which I thank two things. First is the Sugar Cane Train, a steam locomotive catering to tourists that recalls when the entire Kannapali area was fields of Hawaii’s first cash crop; every half-hour of so, we heard the distinctive “whoot-whoot” of the train whistle and the clang of a bell. Second is Roy’s, the well-known Asian restaurant, which recently opened an outpost in the clubhouse: I’ll take a Japanese bento box or kimchi burger over a post-round hot dog any day.